giving new life to a once-deteriorating Sacramento neighborhood. Think Wood has begun transitioning Wood, Naturally content over to thinkwood.com. By leveraging its popular online channels and platforms, Think Wood’s goal is to provide targeted audiences with a quality experience that highlights the benefits of wood in appearance and structural applications, indoors and outdoors, in all segments within the residential and commercial construction and design verticals. The combined content of Think Wood and Wood, Naturally will connect exterior and finishing lumber information with contractors, building owners and remodelers who are seeking information on building and designing with wood and lumber products. Stay tuned for future updates and announcements as we continue to feature more residential content on Think Wood’s website. Wow! Thank you so much. I’m really excited for this. It’s a real honor to be able to attend, and I wouldn’t have been able to without this scholarship. I truly appreciate it. As part of its agreement to co-host the International Mass Timber Conference with the Forest Business Network on March 19-21 in Portland, Oregon, WoodWorks offered 70 free passes to ensure that key developers, architects, and engineers from across the country would be in attendance at this high-profile event. Identify and offer technical support to individuals or teams that indicated they are having difficulty bringing a mass timber project to fruition. WoodWorks received an incredible 653 applications for the 70 passes! Of those, 305 respondents had U.S. projects in development, while 74% had never before built with mass timber. WoodWorks is following up on all leads to offer free project assistance. Hacker Architects in Portland, Oregon, has been in touch with WoodWorks intermittently since 2014 when the company started to explore the use of cross laminated timber (CLT) in its projects. Architects there most recently called on WoodWorks as they were conceptualizing the six-story, 90,000-square-foot District Office building in Portland. In addition to wood, Hacker had considered concrete as a baseline to compare pricing. WoodWorks met with Hacker’s team many times to discuss issues such as panel layouts, span directions, and construction type, and ultimately helped to determine that Type IIIA, not Type IV, construction was the most effective and economical choice for the project. WoodWorks also identified a viable code path to successful permitting. Among the project’s unique design features, CLT floor framing allows portions of the floor to be removed to create double-height spaces. Hacker also used WoodWorks’ carbon calculator to determine that using wood for the project, instead of concrete, equates to removing 547 cars from the road for a year. The District Office project, which is under construction and set to consume over 1.6 million board feet of softwood lumber, marks Hacker’s fourth successful collaboration with WoodWorks. 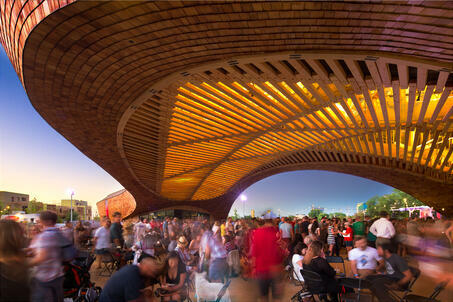 Hacker credits WoodWorks with helping groom and elevate the firm’s expertise in designing mass timber buildings. The American Wood Council (AWC) provides high-quality, free educational offerings that keep specifiers current on the latest news, trends, and techniques in wood design and construction and support them in meeting their ongoing certification renewals. In 2018, the AWC’s offerings reached over 22,000 specifiers, providing more than 36,000 contact hours—a 6% increase over 2017. Participants consistently rated the AWC’s courses as excellent or good. Not surprising, the AWC’s most popular courses in 2018 focused on the recent, significant changes related to wood construction found in the 2018 International Building Code (IBC) and International Residential Code (IRC). Other popular courses explored fire resistance, wind design, mass timber, and green building materials. The AWC is an ICC Preferred Provider, through which it offers 121 courses, and it is also approved via AIA’s Continuing Education System, through which it offers 115 courses. 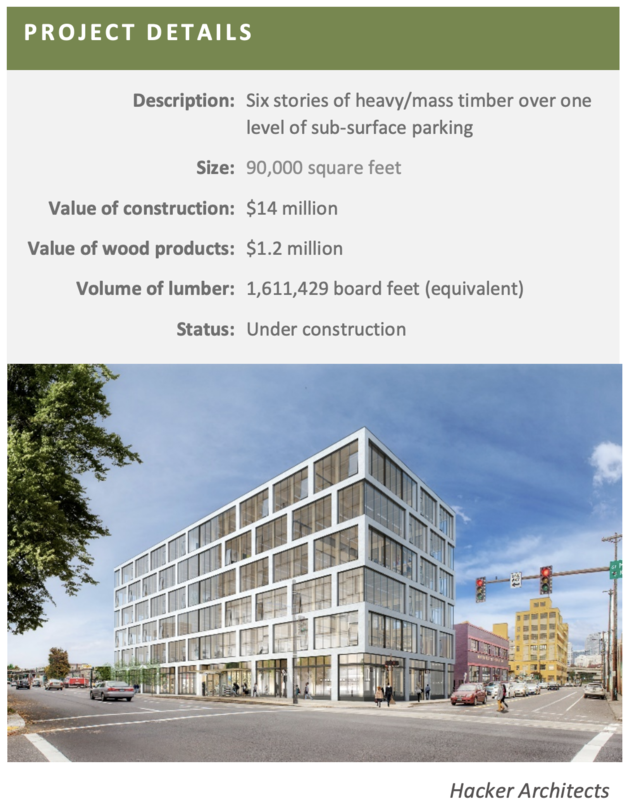 The excitement around mass timber grew throughout 2018, culminating in the favorable preliminary voting results for IBC 2021 code proposals that will allow for wood buildings up to 18 stories tall. 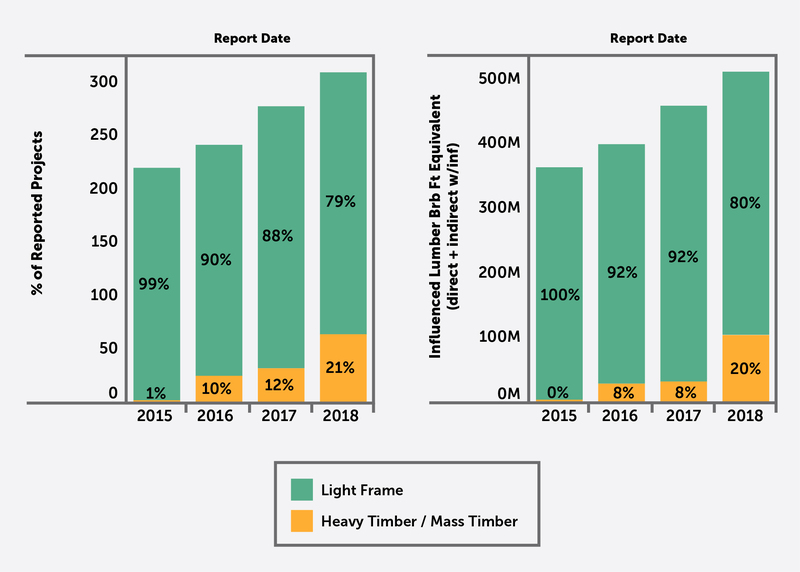 Irrespective of the big changes that new codes will usher in, the volume and size of mass timber projects going to construction has already grown substantially year-on-year, resulting in increased lumber volume. Importantly, the growth in mass timber has been in addition to, and not at the detriment of, light-frame projects, which means the pie is simply growing bigger when it comes to softwood lumber demand and consumption. The majority of WoodWorks’ project assists in 2018 were mid-rise and commercial light-frame structures, which accounted for 79% of all project assists. #ForestProud, a coalition organized by the North American Forest Partnership, recently released new video-based content focused on the role healthy forests have in supporting the ongoing, rapid demographic shift to urban areas. For the first time in history, more than 50% of the world’s population lives in cities, and this number is expected to climb to 70% by 2050. Forests can help planners, builders, and dwellers alike to reimagine and redesign cities for the future, thanks to their environmental benefits, renewable nature, and assets as a building material. Learn more at https://forestproud.org/, and share this and other informative and inspiring content on your social media channels today. The Council on Tall Buildings and Urban Habitat (CTBUH) is the world’s leading resource for professionals focused on the inception, design, construction, and operation of tall buildings and future cities. 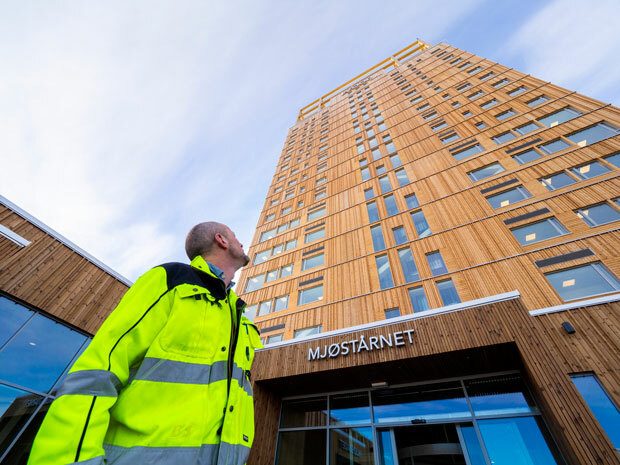 CTBUH has verified the completion of Mjøstårnet, a mixed-use building in Brumunddal, Norway, that now holds the unique title of the “World’s Tallest Timber Building.” At 85 meters, it is also the third-tallest building in Norway and the country’s tallest with mixed functions. This news coincides with the amendment of the CTBUH Height Criteria—the official guidelines upon which tall buildings are measured—to include timber as a recognized structural material. Recent analysis from market expert Matt Layman in the Lumber Market Forecast predicts that the lumber industry will experience a strong spring of 2019, after a fairly sluggish January. However, Layman cautions against buying four to six months of inventory solely on the basis of industry optimism. His forecast hinges on halting rate increases for the market, affordable housing solutions, inexpensive lumber, trade ceasefires, and large pent-up demand in every region of the United States. If his predictions materialize, Layman expects that lumber demand will be strong throughout the second and third quarters of 2019. A group of advocates are urging the city of Seattle to turn to mass timber buildings as a means to solve the city’s pressing housing challenges. Advocates make this suggestion based on recent national legislation and statewide code changes that allow for and/or incentivize the use of CLT. Beyond the possible impact on housing, advocates note the important benefits that the shift to mass timber and other timber innovations can have more broadly for the state, in terms of achieving sustainable working forests, creating jobs, and jump-starting economic growth in rural counties that rely on the timber industry. In May 2018, the Seattle City Council approved the construction of CLT buildings up to six stories on a two-story concrete base; advocates hope Seattle will embrace 18-story tall wood buildings next. 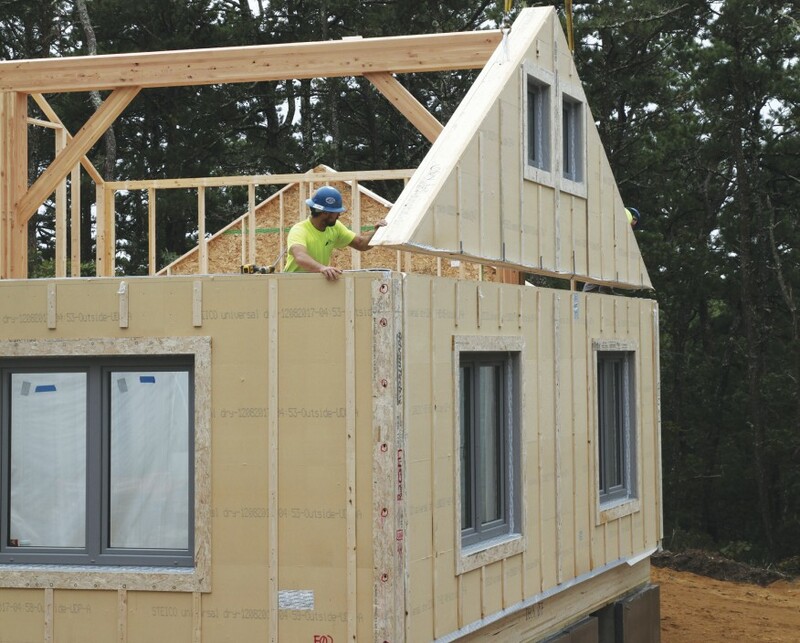 The Journal of Light Construction (JLC) recently went on location with Unity Homes in New England—first to its state-of-the-art design and offsite construction facility in Keene, New Hampshire, and then to its building site in Brewster, Massachusetts. Unity Homes relies on technology to create and convert computer-aided design plans into complete and precise custom-home packages, which Unity’s trained crews then erect on site in a matter of days. Unity hopes to scale up its process as a standard design and building practice across the United States. JLC had its photographer in tow; click here to trace the building’s progress from beginning to end. Since its founding in Quebec in 2014, BONE Structure has been rapidly growing its market share across Canada and, more recently, in California. BONE Structure houses are made up of recycled, lightweight steel frames—which the company claims are more stable than wood—that literally snap together and allow for the design of open-concept homes with scores of windows but no intermediate beams or load-bearing walls. BONE Structure is finding particular traction with sustainability-focused consumers—their structures are inherently designed to achieve net-zero energy efficiency.